Նա հատուկ ուշադրություն էր դարձնում ձայնի օգտագործմանը` այն համարելով «ամենաանհրաժեշտ գործիքը դրամատիկ դերասանի համար»: Ըստ նրա, դա մի տարր է, որը կապում է դերասանին հանդիսատեսի հետ: «Ձայնը պետք է ունենա ամբողջ ներդաշնակությունը, լինի լուրջ, թախծալի, հնչեղ ու մետաղային»: Ամբողջացնելով ձայնի նկարագրությունը` նա գրել է. «Այն պետք է անպայման լինի մի փոքր ռնգային: Դերասանը, ով չոր ձայն ունի, երբեք չի կարող հուզել հանդիսատեսին»: Նա նաև ընդգծել է շնչառական վարժություններ անելու կարևորությունը` երկար հատվածների համար: Նա կարծում էր, որ դերասանուհին պետք է ի վիճակի լինի ասմունքել այս հատվածը Ֆեդրա պիեսից մեկ շնչով. 1884 թվականին Զիգմունդ Ֆրոյդը դիտել է Բեռնարի խաղը Թեոդորա պիեսում և գրել է.
Բրիտանացի հեղինակ Դեյվիդ Հերբերթ Լոուրենսը դիտել է Բեռնարի խաղը «Կամելիազարդ տիկինը» ներկայացման մեջ 1908 թվականին: Դրանից հետո նա գրել է իր ընկերոջը. ↑ 1,0 1,1 German National Library, Berlin State Library, Bavarian State Library et al. Record #118509896 // Gemeinsame Normdatei — 2012—2016. ↑ 4,0 4,1 4,2 4,3 4,4 4,5 4,6 4,7 4,8 Бернар Сара // Большая советская энциклопедия: [в 30 т.] / под ред. А. М. Прохоров — 3-е изд. — М.: Советская энциклопедия, 1969. ↑ 9,0 9,1 9,2 9,3 9,4 9,5 Internet Broadway Database — 2000. ↑ 18th–19th Century | National Museum of Women in the Arts. Nmwa.org. Retrieved on 15 June 2014. ↑ Fantastic Inkwell (Self-Portrait as a Sphinx) – Sarah Bernhardt, French, 1844–1923; Museum of Fine Arts;, Boston; Mfa.org. ; retrieved 15 June 2014. ↑ McCormick, John (1995). "Bernhardt, Sarah" in The Cambridge Guide to the Theatre. Martin Banham (ed.). Cambridge: Cambridge University Press. 9780521434379. ↑ Based on the article Théâtre de la Ville in the French Wikipédia (version 12 juin 2012 à 11:13). Duckett, Victoria. 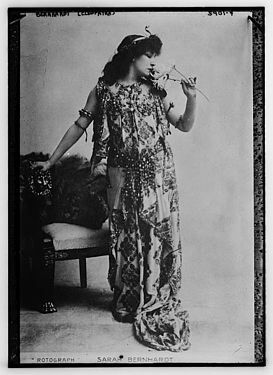 "Seeing Sarah Bernhardt: Performance and Silent Film." University of Illinois Press, 2015. 978-0-252-08116-3. Lorcey, Jacques. 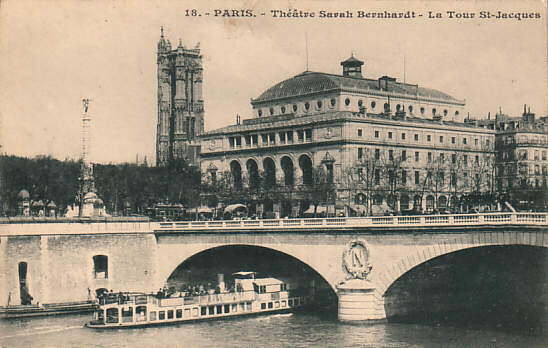 Sarah Bernhardt, l'art et la vie, Paris : Éditions Séguier, 2005. 160 pages. Avec une préface d'Alain Feydeau. 2-84049-417-5.